Father Christmas Came all the way from the North Pole! Awareness of Scouting in 2 ‘Exciting’ areas! of Have you heard Pro-Badge? Hampshire Scouts provides adventurous activities and personal development opportunities for over 16,000 young people aged 6-25, promoting the physical, intellectual, social and spiritual well-being of the individual, helping them achieve their full potential. In Scouting, we believe that young people develop most when they are ‘learning by doing,’ when they are given responsibility, work in teams, take acceptable risks and think for themselves. Seasons Greetings to the December edition of HSN. Where we can, we strive to acknowledge the owner or source of pictures used in this publication. We accept that pictures on public and social media sites are for sharing. We use them under the terms ‘for Scouting use only’. If you would like pictures acknowledged, please let us know the owners name when submitting. Thank you. This will be a fun packed weekend of Scouting activities including fire lighting and cooking outdoors. Beavers 71/2+, Cubs 10+, Scouts 13+, Explorers and Network. Some years ago, when we were considering nationally how to improve Scouting’s image during the Centenary, we looked what Scouting’s “brand” should be. A “brand” of course isn’t just a logo or a design, as any marketing professional will tell you – it’s the essence of what an organisation or product stands for. A brand is the “promise of value” to the customer – why people join, buy or show support. And in Scouting’s case the idea of “promise of value” is especially important. As we get ready for 2014 and an even more exciting year of Scouting, it’s worth reflecting on Scouting’s brand and thinking about what we all need to do in order to make this “promise of value” a reality. 1. Everyday Adventure – the brand statement we’ve been using in Scouting since 2007. It’s the biggest reason young people join and stay, it’s what most people remember about their time in Scouting, and it helps to achieve our aim of developing young people. Unpick the brand statement a bit more, and you’ll discover it’s not only about adventure. It’s “everyday adventure” that’s accessible to all young people, from Beavers cooking twists on an open fire, to Scout Network members completing Queen’s Scout expeditions in the mountains. And it’s “adventure everyday” – not just in the summer, or on camp, but in the Scout HQ week after week – adding adventure to young people’s lives every week. 2. Values - of trust, loyalty, friendship, family, courage, responsibility and respect. These are in our Promise and Law, and hopefully embedded in the culture of our meetings and behaviour every week. And not just for the young people – for us adult volunteers as well. They’re not empty words – they’re actions we need to live out in practice. If you watched the Doctor Who special, you may have spotted a great quote from the Roman Emperor Marcus Aurelius – “Waste no more time arguing about what a good man should be. Be one.” 3. Community – Scouting works best when it is a community – the welcoming friendship of the Cub Pack or Explorer Unit, the “social life with a purpose” of adult volunteers, the parents who come together to help with fundraising and support their children in experiencing all that Scouting has to offer. But Scouting also has to be an integral part of the wider community – out there, offering adventure, fun and friendship to more than just its traditional members through community service, activity opportunities, and embracing diversity. Pope Francis has recently said he preferred a Church that was “bruised, hurting and dirty because it has been out on the streets, rather than a Church which is unhealthy from being confined and from clinging to its own security”. What would a similar vision for Scouting be like? So there you have it – the “brand” of Scouting – everyday adventure, values, and community. Brands of course only work if they deliver on their promises. Do we? e travelled a long way to see Father Christmas. He wasnâ&#x20AC;&#x2122;t at the North Pole, he was at Paultons Park. We all had a great day running around in the rain having a go on all the rides. All of Hayling Beavers went into the Winter Wonderland together. I liked the sleeping polar bears best. I could see them breathing. Father Christmas gave me a dinosaur jigsaw puzzle, my little brother got a car. At the end of the day it was starting to get dark and all the lights looked bright in the park. My socks were very wet but that didnâ&#x20AC;&#x2122;t stop me having a lovely day. Beavers visit to Paultons Park In November just under 4000 Beavers, leaders and helpers all met up at Paultons park for our annual trip to see santa. The day started wet but spirits were still high and by mid morning everyone was in, rides were whizzing along, puddles were being splashed in and presents were being unwrapped by children. At lunchtime, the sun came out and chip the Beaver, looking a bit soggy, cut his birthday cake. He was the big 3 this year and we all gathered to sing happy birthday to him. All in all another great day for Hampshire Beavers, thank you to all leaders for your hard work in getting your colonies there and all adults involved in arranging the event. There are still some badges left over from the event, so if you would like some more please contact valerie.kench@btinternet.com Teresa Ginn, ACC Beavers. Discussion topics: , Safeguarding, challenging children, , Sleepovers and , campfires. Meet other leaders, swap ideas. Awareness of Scouting in two ‘exciting’ areas! I am very pleased to say that Hampshire Scouts have been nominated by the Freemason’s Grand Charity to receive a grant for 2014, as part of the on-going support to the Association which the Freemason’s have been providing since 2010. Over the last 4 years the Grand Charity has been providing much welcomed support now to 30 Areas/Counties across England and Wales with a number of innovative projects being undertaken resulting in new sections and Groups, raised levels of public awareness and publicity and an increasing building of local relationships between the two organisations. We have decided to use this money to increase the awareness of scouting and the opportunities it offers young people in two ‘new’ areas across the county. 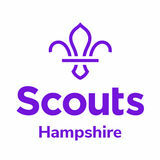 The first project is to put scouting into 3 of our major hospitals and potentially a hospice. We have already established good links through our existing contacts and will be moving the project forward in the new year. The 17th Holburn Scout Group in Great Ormond Street Hospital has been running since 1957. They have a team of leaders who visit once a week and provide a scouting activity to those young people well enough to attend. By the very nature of the unique situation they do not know how many young people they will have and what ages they will be. Some weeks they have 5, others they may have 15. The young people are escorted to the play area and receive a group scarf for that night. At the end of the session they return the scarf and receive a certificate of attendance. http://thunderation.net/17thholborn/whatwedo We intend to set up an Active Support Unit to run our sessions and this will allow the adults involved to be there on a flexible rota. There are 7 similar groups across the UK and plenty of support and experience to help us get this going! cott aged 13 from 6th Fleet (Ancell’s Farm) Scout Group, has successfully represented his troop and won the Junior Biathlon at the National Scout Air Rifle Championships,which were held at the NRSA Bisley, Surrey. He was awarded the Normanton cup as well as a Gold Medal and received a Silver Medal for Pistol shooting. oung people from 1st Aldershot Scout group spent an evening learning about disaster relief charity ‘Shelterbox’ in the week that the strongest storm ever recorded began hit the Philippines. Trained volunteer Tim Vile visited the troop in North Town to explain a bit more about the charity and what they do in what had been a very busy week for their volunteers. Shelterbox provide emergency shelter and lifesaving supplies for families around the world who are affected by disasters, at the time when they need it the most. Since founding 12 years ago they have responded to over 200 natural or man made disasters in almost 90 different countries and provided lifesaving aid for well over one million people. The evening began by showing the group of young people a very moving video focusing on some of the areas where Shelterbox are involved in helping out. The Scouts seemed quite stunned by some of the conditions that people were living in overseas. Tim then went on to talk about the work the charity carries out and how the recipients of their ‘Shelterboxes’ benefit. Shelterbox visit st 1 Aldershot Scouts The Scouts even had the chance to view the contents of a real-life Shelterbox. One of the big green boxes was brought to the Scout hut and they were asked to guess the kind of things that Shelterbox would provide in one of these. They were quite surprised to find out just how much the Shelterbox contained and how useful everything inside was (especially when they found out some of the uses of the box itself in some areas e.g. a water container or a cot). ShelterBox have an effective solution to disaster response, they deliver the essentials a family needs to survive in the immediate aftermath of a disaster. Each large, green ShelterBox is tailored to a disaster but typically contains a disaster relief tent for an extended family, blankets, groundsheets, water storage and filtration equipment, cooking utensils, a basic tool kit, a children’s activity pack and other vital items. The Scouts were quite intrigued to find the Shelterbox would usually include a stove inside. The Scouts were guided through each of the items in the Shelterbox and even got to have a go at putting up one of the Shelterbox tents (which recipients may have to live in for several years). The Scout Concession: unit also enjoyed having their very own broadcast station set up in their back garden and Emergency Services & Armed Forces @ £15 per ticket £ most of the young people even had a go at communicating and chatting with various other network Concession: Under 16s & uniformed Scouts & Guides @ £7 per ticket £ users under FDRS’ guidance. It was an interesting evening for them to learn and try out a different Concession: Uniformed Scouts & Guide Leaders @ £7 per ticket £ experienceChild andU16’s another aspect of communication. @ £7 per ticket £ Farnborough & District Radio Society holds meetings at the Farnborough community centre and can are 16-18, 60 or over, students, emergency services & armed forces. Proof of ID required when entering the stadium advise you* Concessions on how to get started in the exciting world of amateur radio (www.farnboroughradio.org.uk). If you would like to know more about 1st Aldershot Scouts visit www.1staldershot.co.uk or on Twitter Payment Details #1stAldershot. By cheque: There is no charge for cheques. Please make payable to Reading FC. By Debit/Credit card: We do not accept American Express or Diners Club. In 2013, over 1000 Scouts and Guides attended from Hampshire for a totally thrilling game of Premiership Rugby. Winchester Explorer Scouts, representing Royal Be Hampshire beat therkBerkshire scout team in the half time penalty drop goal shire Co unty competition. Debit/Credit We do not accept American Express or Diners Club. FC. ByBy cheque: There card: is no charge for cheques. Please make payable to Reading By cheque: There is no charge for cheques. Please make payable to Reading FC. By Debit/Credit card: We do not accept American Express or Diners Club. By Debit/Credit We There do notisaccept American Express or Diners Bycard: cheque: no charge for cheques. Please makeClub. payable to Reading FC. Credit/Debit card By number: Debit/Credit card: We do not accept American Express or Diners Club. By cheque: card There is no charge for cheques. Please make payable to Reading FC. Credit/Debit number: Credit/Debit card number: By Debit/Credit card: We do not accept American Express or Diners Club. 6th Fairtrade Cooking Competition Saturday 1st March 2014 - 11.30 to 15.30 Cranborne College, Basingstoke. Entries are invited from teams of 4 Scouts, Guides or mixed, aged 11 to 17, for our 2014 Fairtrade cooking competition which will be held during Fairtrade fortnight. During this time many shops including food shops promote extra Fairtrade products during this time. So if you do your survey some weeks in advance, you could ask the store manager to request some extra Fairtrade products for your team. The food preparation rooms at Cranborne College are very well equipped, so it is possible to produce a good meal of the same quality as you might do at home. Whilst the variety of fair trade products grows each year, neither fish nor meat is suitable for this type of labelling so it does mean that dishes have to be vegetarian in nature. Whilst this might seem to be a handicap, for many people in developing countries they devise recipes around what’s available locally. The challenge is for teams to source their own fair trade ingredients wherever possible and bring along all the necessary ingredients. If you undertake the survey, design and display a poster advertising Fair Trade fortnight, take part in the competition and write down your recipes then you your team will qualify for the Scout Global Challenge award. Survey the availability of fairtrade products in at least 3 local shops. Enquire from each store manager why they stock certain fairtrade products. Why they think people buy fairtrade products. Complete survey form and email to Rayner Mayer. Make a poster advertising Fairtrade fortnight 2014 and display in your meeting place and one place in your village. Devise a 3 course meal. Purchase your fairtrade ingredients to serve 4 people (either your team or invited guests). Arrive between 11.30 and 12.00. Prepare your meal. Serve your meal to 4 persons between 14.30 and 15.00. Tidy up as the rooms will be used on Monday morning by school. Range of fairtrade ingredients. Innovative and balanced menu. Methods of preparation. Team work. Serving and quality of meal. Scouts, Cubs and Leaders from 1st Petersfield Scout Group, have been raising money for the Royal Marines Association Fisher House Appeal over 2013. The Group carried out a bag pack at Waitrose, undertook a sponsored 30km trek along the South Downs Way and the Cubs ran a fair one Pack night. In total in excess of ÂŁ3,000 was raised. The money went towards funding a multi-use games area, adjacent to the Queen Elizabeth Hospital in Birmingham, where all seriously wounded service personnel are treated. Fisher House, a home from home for the families of the injured, was opened in the summer by Prince Charles and on 22nd November, Group Scout Leader Oenone McKellar and Assistant Cub Scout Leader Sarah Underwood attended the official opening of the MUGA. The ribbon was cut by Mark Ormrod, the first triple amputee from the Afghanistan conflict, and Baz Barrett who lost a leg, both ex-Royal Marines. They both agreed that this facility would provide a valuable resource to enable rehabilitation to start at the earliest possible opportunity, as well as enabling the families, particularly the children, to play games with their parent helping them to come to terms with their parentâ&#x20AC;&#x2122;s injuries. For the last 30 years Scouts from Hampshire have been travelling to the Lake District at Easter to climb some mountains – now it’s your turn! Enjoy Hill Walking? Then spend a week doing it! What: A week of hill walking including a night of wild camping. Where: Based from the Hope Memorial Centre in the village of Braithwaite in the northern Lake District. How much? The trip costs £195 payable in two instalments, £75 on registration and the balance of £120 by 4th January 2014. When: Saturday 12th to Saturday 19th April 2014 with training on the 4th January and 1st - 2nd March 2014. Who: This is predominantly a trip for older Scouts (12+), but some Explorer places are available. How do I join in? Complete the registration form overleaf and return it to the address below along with your deposit. Hurry, places are limited and will be allocated on a first come first served basis. I wish to register for a place on the 2014 Hillwalking trip to the Lake District. Please delete where appropriate: I am interested in / already hold the Scout Hillwalker badge. I am interested in / already hold the Expedition Challenge. I am interested in / already hold the Explorer Scout Mountain Activity Badge (Option A). 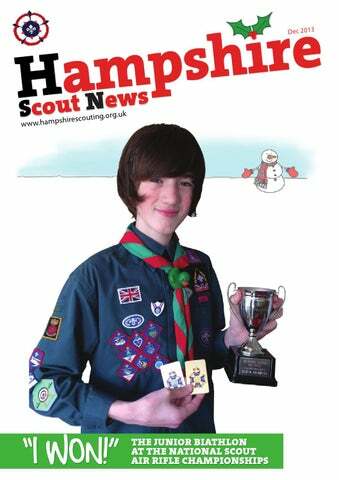 I enclose a cheque for £75 payable to Hampshire County Scout Council. What's been going on in the past month.